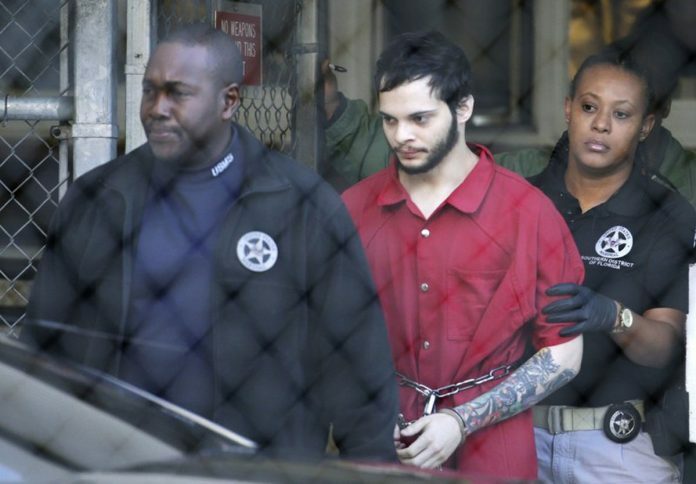 Federal prosecutors filed court documents Monday in which an Alaska man agreed to plead guilty to a Florida airport shooting rampage that killed five people in exchange for a life prison sentence. The agreement says that Esteban Santiago, 28, will plead guilty to 11 of the 22 counts against him in the attack that also left six wounded. Prosecutors reached a deal with Santiago’s defense lawyers not to seek the death penalty in exchange for the guilty plea. Instead, Santiago would serve a life prison sentence plus 120 years, according to the documents, and will waive his right to appeal the sentence. The deal is expected to be finalized Wednesday in Miami federal court before U.S. District Judge Beth Bloom. The mentally troubled Santiago, of Anchorage, Alaska, acknowledged in the document that he flew on a one-way ticket from Alaska to Fort Lauderdale-Hollywood International Airport with a 9mm handgun in a checked weapons box in on Jan. 6, 2017. Santiago loaded the gun in a bathroom and came out firing, emptying two ammunition clips before lying on the floor and surrendering to police. Fifteen bullet casings were recovered. Santiago, an Iraq war veteran who has been diagnosed as schizophrenic, initially told the FBI he was acting under some form of government mind control. Then, he changed his story to claim that he shot his victims in support of the Islamic State extremist group, but no ties to terrorist groups have been found. Since his arrest, Santiago has been treated for his mental illness and his attorneys have repeatedly said he is competent to understand the legal proceedings. Prior to the shooting, he was briefly treated at an Anchorage mental institution after showing up at the local FBI office claiming to be hearing voices, then released with no restrictions on owning a gun, authorities have said. The statement of facts filed Monday — signed by Santiago and his attorneys — lays out in detail the actions Santiago took that day, as well as a few new pieces of evidence. For instance, the document states that Santiago researched the layout of the Los Angeles International Airport three days before flying to Florida, but does not indicate why he did that or why he ultimately chose Florida. It also describes the injuries suffered by the six wounded people along with the multiple surgeries and medical procedures they have had to endure. Before leaving for Florida, the document says that Santiago threw out some possessions, such as personal papers and clothes, which were found in a trash bin at the Anchorage motel where he was living. One piece of paper “appeared to be a checklist, which included a notation to ‘clean’ the laptop,” the document says. Yet after replacing the hard drive on his laptop, the document says it was left behind in Alaska. Santiago also will forfeit to the U.S. government the 9mm Walther handgun using in the shooting, according to the agreement.